This week, World Masters Games 2017 celebrates one of the most important milestones in the lead up to the Games – ‘One Year to Go’! 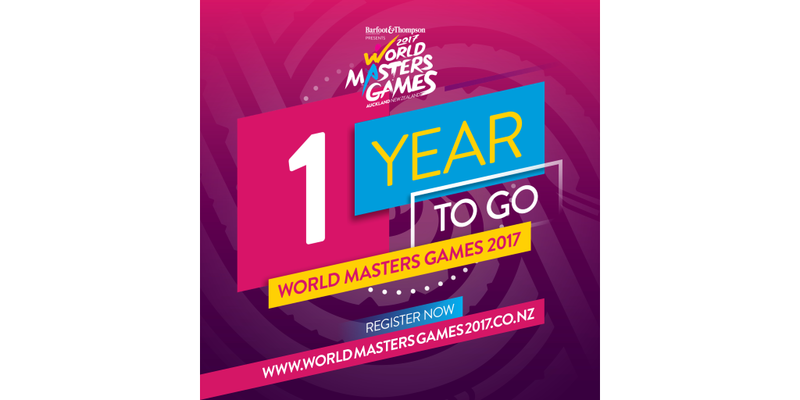 New Zealanders: Enter the World Masters Games 2017 by 31 May 2016 to go in the draw to win a $500 sporting goods voucher! On Thursday 21 April, the World Masters Games countdown clock dips under 365 days until the day of the Opening Ceremony at Eden Park officially launches 10 days of sporting excitement and camaraderie. The World Masters Games Team are thrilled with the diversity of athletes who’ve already signed up the Games, with competitors from more than 50 countries already confirming their registrations, and ages ranging from 25-95 years. As with all other World Masters Games, there is generally no need to qualify or be selected to compete. As long as you are over the minimum age for your chosen sport (35 for orienteering as at 31 December 2017), and meet the minimum disability classification requirements in the case of para-sports, you can take part. For orienteering, supporters courses will be available for those under 35 as at 31 December 2017; at this stage details are to be confirmed. There are a range of activities to raise awareness of the milestone, with a particular focus on taking the Games around Auckland and Waikato to ensure locals don’t miss out on this opportunity of a lifetime to compete in the world’s largest multi-sport event on their ‘home ground’. Between 21-29 April, the WMG2017 Volvos will take to the roads of Auckland and Waikato with staff ready to share the Games story with sports clubs, community and leisure centres, sports shops and anywhere else with a community noticeboard. This is an opportunity for us to create connections with our grassroots community to encourage participation in the Games – as an athlete or volunteer. On Wednesday 27 April, the Sport/Business section of the NZ Herald will be wrapped in a WMG2017 supplement, taking the Games to a large audience throughout many workplaces and homes. In addition, six of NZME’s regional papers will also be wrapped, ensuring the Games message reaches into a number of our important ‘drive’ markets. On Saturday 30 April, the WMG2017 staff are setting up all-day activations in four high profile locations – St Lukes, Sylvia Park, Botany Town Centre and Wynyard Quarter, to create a fun and engaging platform for the WMG2017 staff to speak directly to prospective athletes. In addition, WMG2017 will have mobile crews in Auckland and Waikato visiting sporting and leisure facilities to speak to people as they participate in Saturday sport – either themselves or with their families. As a special bonus for weekend warriors, they are also giving away free coffees in WMG2017-branded coffees cups at six Auckland cafes in areas where people stop in for a morning coffee before/after their exercise, reminding them it’s just one more year of training until the Games! The WMG2017 media partner, MediaWorks, will be helping to create profile around both of the activities with a schedule of advertising and promotional support across a number of radio stations. WMG2017’s digital channels will be very busy with 1YTG messages throughout the ten days, with their website, social media and direct content all having a 1YTG theme. There is a Facebook event available to help add the Opening Ceremony at Eden Park to your social calendar. To encourage New Zealanders to get their registration completed, WMG2017 is running a competition with everyone who enters the Games by 31 May to go in the draw to win a $500 sporting goods voucher! From May 1 there will be a promotion for international competitors to promote the fact that flights are open for booking. One lucky Games competitor who registers between 1-31 May 2016 will win free flights to/from Auckland.